“Bambinatum est maggitum.” [Children are maggots] – the motto of Crunchem Hall School. The sayings and philosophies of primary school aged children are often ridiculed. To be fair, there is sometimes some justification for the absurdity of what they say. Take, for instance, these actual sayings that I have had the privilege of overhearing: ‘All of our Mums have the same name!’ and ‘I used the remote and 1 plus 1 is 11’. 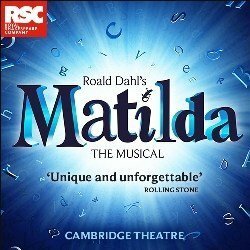 Matilda the Musical centres its narrative on a child prodigy whose logical thought patterns display a maturity far beyond her years, and whose style of conversation is far removed from most children her own age. Matilda Wormwood (at this performance, Lara McDonnell, making her West End debut in this production) finds herself being raised in difficult conditions (for difficult read ‘unsupportive’ rather than ‘financially poor’). The show harnesses a dazzling array of styles and methods to unravel its narrative. There’s dancing, there are ballads, there are anthems, there are swings and scooters, and the loudest librarian in the universe in Mrs Phelps (Lisa Davina Phillip). This is a musical that almost wiped the floor at the 2012 Olivier Awards: Best Actress in a Musical for the four girls that played Matilda in the original West End cast, Best New Musical, Best Actor in a Musical (Bertie Carvel as Trunchbull), Best Director, Best Theatre Choreographer, Best Set Design and Best Sound Design. The Tony Awards were not unkind to the Broadway incarnation, and even the cast recording was Grammy nominated. It is, in short, to quote one of its songs, a ‘Miracle’ indeed. The songs contain a lot of wit and help to drive the story forward, keeping all but the most stubborn of children in the cosmopolitan audience attentive. As Matilda herself put it, “You could have heard a fly burp.” Matilda’s parents, Mr Wormwood (James Clyde) and Mrs Wormwood (Kay Murphy) are aliterate – meaning they do have the ability to read but deliberately choose not to exercise it. It’s a word I picked up from BBC Television’s University Challenge, and thus, to be fair to Mr Wormwood, affirms his assertion that “telly” has educational value. Anyway, both the Wormwoods and the overly authoritarian Miss Agatha Trunchbull (Craige Els: yep, it’s a drag role), headteacher at the Crunchem Hall School, solicit much laughter from the audience at their obscene and ridiculous remarks and putdowns. It is these insults – so vulgar they cease to be insults (eating cake, allegedly, is to be allied with Satan) – that solidify the story as a triumph over adversity tale. We see in the character of Miss Honey (a very sweet and likeable Charlotte Scott), Matilda’s form teacher, a refutation of the saying ‘Sticks and stones may break my bones, but words will never hurt me’, and it takes the genius of Matilda to see things are put right in her (Honey’s) life. The show attempts to indulge in subversion, both of audience expectation and musical theatre convention, by putting forward the notion that there aren’t always happy endings (though, without giving details, the musical’s own finale is not exactly sad). Matilda the Musical is full of heart and passion. There are lyrics in ‘Naughty’ so true of almost anyone’s station in life: “Just because you find that life’s not fair / It doesn’t mean you just have to grin and bear it […] If you sit around and let them get on top / You might as well be saying you think that it’s okay / And that’s not right!” A clarion call to get active and make a positive change if ever there was one. These lyrics are indicative of the show’s ability to inspire both adults and children in its audiences. My favourite of all the tunes, though, is one called ‘School Song’, which works its way down the alphabet to describe the unpleasantness of the “living L [hell]” that is a typical school day. Roald Dahl’s much-loved story bursts into life on stage in this new and innovative musical version by Dennis Kelly and award-winning musician and comedian Tim Minchin. Adults and children will be enchanted and thrilled by this spectacular story of the special little girl with an extraordinary imagination.